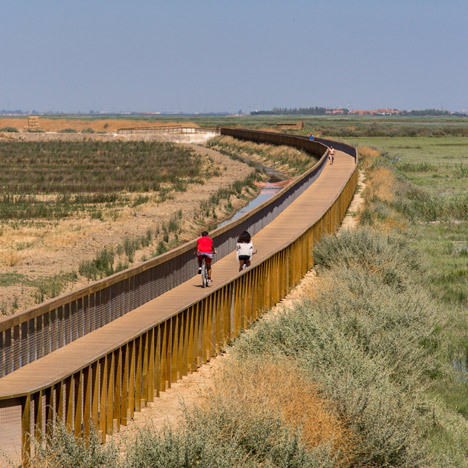 Lisbon firm Topiaris Landscape Architecture has extended a 700-metre long timber walkway through wild riverside scrubland to connect a new Portuguese public park with a bird observatory (+ movie). 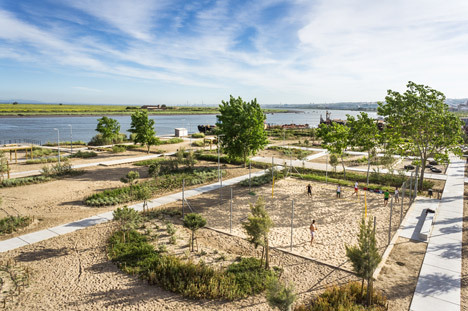 The 15-hectare Tagus Linear Park was designed by Topiaris Landscape Architecture for the riverside city of Póvoa de Santa Iria, off the south-west coast of Portugal, and offers outdoor activities including fishing and wildlife watching. The main park space, called Fisherman's Beach, provides spaces for beachside volleyball and exercise classes. Largely covered with sand, this space is divided up by a grid of flagstone pathways and interspersed with a variety of native plants and trees. Other spaces include a picnic site positioned over locally sourced timber planks and a dedicated play area for children. The park sits next to a shipping dockyard and the designers wanted to recreate this aesthetic with their architectural structures. They used old wooden pallets to create the bird hide, which offer sheltered views towards the rare wading birds native to the area. A visitor centre and facility building were built from recycled shipping containers, clad with timber slats. Only the ends of the containers are left exposed, creating large doorways, while windows are provide by floor-to-ceiling strips of glazing. A 700-metre-long timber walkway stretches along the river's edge to connect the park with the bird hide, suspended over a series of twisting streams. This also connects with a six-kilometre network of pedestrian trails and dirt tracks, which nestle into the landscape and are bordered by cylindrical wooden stumps. The firm preserved original foliage and wild flowers beds dotted around the park, by creating pockets of shrubbery between timber pegs. Balconies protrude onto the river's mud flats for when the fishing season is high, and slatted wooden beach huts stand on the beach, sheltering sunbathers from the Mediterranean sun. Further down the beach, a terrace projects over the river, while wooden viewing platforms offer a vantage point over the riverside scenery. Other riverside parks completed in the last year include a pathway in Tasmania featuring brightly coloured boardwalks and a timber viewing platform offering views of the River Daugava in Latvia. Photography and movie are by Joao Morgado.